As promised, our second vacation to Anguilla was to include a comprehensive report of Anguilla's signature cocktail... the rum punch. My wife and I discovered the heavenly beverage on our first trip, and returned six months later to revisit the island and do a little more "research." Although we didn't get to visit every place on the island that offers rum punches, we did cover quite a lot of ground. 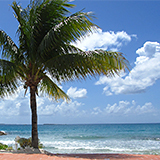 19 establishments to be exact, three of which were in St. Martin on our stay over there. Madeariman - no discernable guava, heavy lemon juice, bitters, a bit thin, cinnamon/nutmeg already mixed in, "unusual"
Sammy's (between Elvis and Johnno) - not very complex, no spices, too sweet, malibu and meyers only, no Mt. Gay, Amaretto etc. Smokey's - cherry and orange garnish, nice fruit juice blend, good guava, meyers dark rum "floater", no spices, good balance. Gwen's Reggae Reef - very strong!!! and only $5 US, cinnamon and nutmeg garnish, lime slice, coconutty from malibu. Good guava. Very nice. Barrel Stay - good guava, a bit light in body and low alcohol, lime garnish, mellow, like "hawaiian punch". Excellent dinner there too. Tasty's - much like Barrel Stay with a Meyers dark rum "floater". "Hawaiian punchy," lemon garnish, no spices, good blend. Ferry Boat Inn - great hospitality, however rum punch was a little "off." Campari, lemon juice, bitters... unusual. Cinnamon and lime garnish. No fruit juice, too sweet and acidic. Couldn't finish. Da'Vida - excellent balance, lemon lime and cherry garnish, guava present, no spices. Mahi Mahi - strange whiskey taste (like barrel aged rum? ), didn't work, no spices. Mango's - nice balance, a bit strong, very nice, terrific with wahoo tartar and sesame oil. No spices. Johnno's - nice fruit blend, orange garnish, no spices, strong at first sip but mellows nicely. Good guava. Uncle Ernie's - Strong, not very complex. Driftwood Boat Bar (at the beginning of the airport runway at Maho bay) - made with peach schnapps, no guava, no spices, no garnish, not bad, Capt. Morgans, some complexity. Bar at Holland House Beach Hotel - some guava, nice garnish of cherry, orange, lime. Made with Vodka.... yuck. Jumbie bar at SXM airport - low alcohol, redominant orange juice, cherry garnish, no spices, guava, some amaretto. Nori's Reply: WOW! 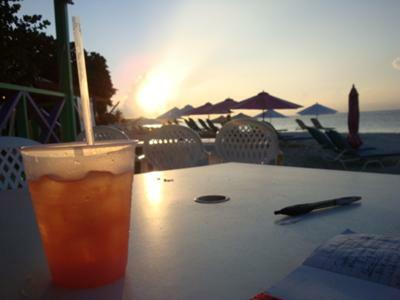 Tim, thank you so much for the Rum Punch Report! Covering the rum punches in St. Martin, too? (I'm glad to see that we kind of "beat" the drinks over there, he he!) Talk about comprehensive - I don't think my Dad has even tried all of these rum punches! I will have to get his official rum punch report and see how the two match up. Thank you so much for taking the time to create and share such a great guide! Update: We have started to create a "report" of our own, inspired by your guide, Tim :-) Focusing on our favorites, here's a little more on Anguilla rum punches. I think the policy is to just drive safe. If you cause an accident from being drunk and unsafe, then there can be trouble. 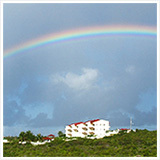 We are looking forward to our first trip to Anguilla in April 2011 for my 50th birthday. Want to try all the different rum punches, but what are the DUI laws on the island? Not planning on being "soused", but don't want to get in trouble after just a couple of drinks. Are they strict, or understand we are on vacation?? Great report, Tim- but you missed Bankie Banx's famous Duneshine... His Ginger Rum Punch is amazing- strong and very tasty! That's one heck of a rum punch report. Maria's rum punch at the Arawak. She pours until the glass is overflowing and somehow crams even more run into the glass after that. ;-) Then she adds all the right stuff in just the right proportions. And hats off to you, Tim. Next time on island we'll have to clink a glass or two!